I petted my dog one last time as the kennel attendant led him away. Traveling is always such a hassle when you have to leave on short notice. And my poor dog. He’d just gotten a new toy that he was really excited about, but I decided to send him with his old one to give him a sense of security. Security is important when you’re in an unfamiliar environment. That’s why I’m always sure to purchase travel insurance for myself when I travel. According to the Travel Health Insurance Association, nearly 23 percent of Canadian respondents to a travel poll admitted to having needed medical attention while traveling. This is despite the fact that nearly 47 percent of respondents have never actually reviewed their policies. It’s always important to review your travel insurance policy, but it’s even more important to have one, considering there is such a high incidence of medical attention necessity while traveling. Hospitalization in the U.S. cost approximately $3000USD per day, excluding cost of other medical services during the stay. The field of Canadian travel insurance is chock full of examples like the ones mentioned below of citizens who have been caught in unfortunate circumstances while traveling. 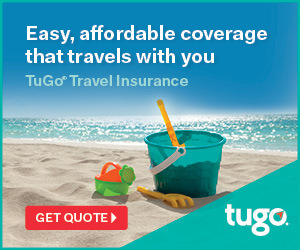 Fortunately, the success stories of people covered by travel insurance policies from companies like TuGo® have saved traveling Canadians often up to hundreds of thousands of dollars each. You may be asking yourself how effective having a travel insurance policy actually is. The answer is that it is incredibly effective. In fact, nearly 93.5 percent of all travel insurance claims are actually paid, according to the Canadian Travel Health Insurance Association. There are a few things that can cause a claim to be denied, but they are generally isolated considerations like pre-existing conditions or a change in prescription medication. While on a relaxing trip to Montana, James was struck with an unexpected brain aneurysm. At just 48-years old, James never would have suspected that what started out feeling like a simple headache would worsen to something so unbearable, cause him to lose consciousness, and threaten his life. The medical bills for the emergency, complicated procedures and all of the specialized transportation and test were enormous. James’s Canadian provincial insurance paid for just 2.5% of the entire claim. That would have left James to cover over $435,000 of medical bills on his own. James had the foresight, though, to purchase travel insurance that covered the entire remainder of the bill effectively saving James’s life, his life savings, and his quality of life for years to come. Don’t let a lack of this simple protection have life-devastating results for you. People consider travel insurance much more often for personal travel than they tend to for business travel, but there’s really no discernable reason for this. Perhaps people just feel more responsibility when planning their own person trips. However, just the shockingly small amount of less than one percent of respondents to the THIA poll reported that they purchase travel insurance when traveling for business. Travel Insurance covers customers whether they are traveling domestically or whether they are traveling abroad. That’s especially important since the number of Canadians traveling abroad has increased each and every year since 2001. In fact, in 2010, there was a 10% jump in the number of Canadian citizens traveling abroad, the highest yearly total of all times. As health costs are not universal from country to country, it can be very easy for Canadians to wrack up unexpectedly huge medical costs in some foreign countries. If you’re driving outside of Canada to the United States, for instance, it is best to purchase travel insurance to cover health, life, and disability costs. As most of us know, the United States does not have a universal health care system that covers or protects Canadians in any way, so it is very important that any medical needs are covered to the greatest extent possible. If you’re flying outside of Canada, it can also be important that your travel insurance policy covers lost documents, interrupted trips, flight cancelation, and lost luggage. These are some additional considerations that might not always occur to us and that might not otherwise be covered by other types of existing insurance that we might have. Who hasn’t heard of luggage being lost or flights being cancelled? These types of incidents can have catastrophic consequences and can seriously derail an otherwise lovely trip. So why not take precautions against such an potential tragedy? When 4-year old Isaac fell into a swimming pool during his family’s vacation to California, what started out as a normal, enjoyable warm weather visit turned into a nightmarish scare and a medical emergency. Luckily, Isaac didn’t even suffer any negative medical or physical effects from the accident, but his family would have still been on the hook for over $19,000 worth of medical bills. Most family vacations are budgeted and saved for; very few family plans include an extra $20,000 for uninsured medical bills. You may be able to see the benefit in gaining coverage for travel-related issues, and you may be able to appreciate that health care costs outside of Canada may differ from those inside of Canada, but still not sure why your existing health insurance wouldn’t still be sufficient in the case of a medical emergency outside of the country. Whether or not you’re aware of it, your Canadian insurance is most likely completely useless outside of Canada. So, travel in Canada. Travel abroad. Travel by land, by sea, and by air. However and wherever you travel, though, take with you the confidence that you will be taken care of should any unfortunate incident occur. Know that your dog won’t be stuck in the kennel while you’re stuck in another location or stuck under a mountain of debt. Wander, experience, and enjoy adventures, but do so safely, and plan for the unexpected. Over 23 percent of travelers have reported needing medical attention while traveling. That’s almost one of the people in your four-person row on the plane or one of the four people traveling in your car. There are also optional sports coverage, car rental insurance, and others. Most Importantly – when things go wrong, they are available 24/7 to make sure you get the help you need. Isn’t that super awesome? Protect yourself, and your family & friends on your next trip.